In the Rolls-Royce view of the private office, the minister gets what the minister wants. However, the private office’s job is not just to look after the ministers. It has the equally important jobs of co-ordinating the department’s work and resolving conflicts both inside the department and with other departments. Once we look at the work of the several central units that form the ‘departmental court’, it is clear there are several problems: fragmentation, rapid turnover of staff, burn out, recruitment, and an entrenched culture of long hours. 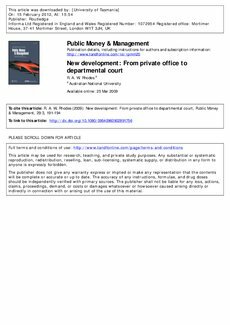 To ensure departments have effective executives, we need to move beyond the minister’s private office and explore ways of strengthening the capacity and capability of their departmental courts.